The Phillies have signed right-handed pitcher Edgar Garcia to a minor-league contract. Garcia, 25, spent 2012 with the El Paso Diablos of the Independent American Association, posting a 6.53 ERA in four starts. Garcia was once a promising Phillies farmhand, signing at age 16 in 2004, coming equipped with a plus change-up. 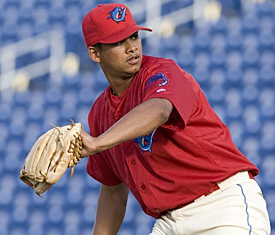 Garcia reached Double-A Reading in 2008 as a 20-year old but has since struggled to stay on the field due to injuries. In 2011, his last appearance in organized professional baseball, Garcia appeared as a swing-man for High-A Wilmington and Double-A Northwest Arkansas of the Kansas City organization after signing with them as a minor league free agent. Garcia will likely start the year in High-A Clearwater or Double-A Reading and could see time as a reliever or a starter.